A Clothes Look At Style – arts, ink. Glance at your closet and look at the kinds of clothes and accessories you own. Then, think of five adjectives that best describe your whole wardrobe. Next, think of five adjectives that fully describe yourself and your personality. Now, compare both groups of words. 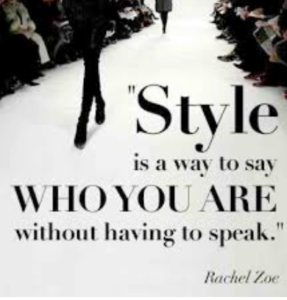 According to Rachel Zoe, “fashion is a way to say who you are without having to speak,” so it should not surprise you if you repeated any words between the two groups I had you brainstorm. With her simple quote, Zoe sends a powerful message to society. Although she is explicitly talking about your physical appearance with fashion, she is actually alluding to the way clothes make you feel about yourself and the way you present yourself to your peers. Generally speaking, when you wear clothes in public (whether it be with that guy you wanted to impress, or to office hours with your professor), you think of how comfortable your clothes feel, how your clothes interacts with your curves, and how you think your peers will perceive you. Funnily, whenever you choose your outfit for the day, you think of all of these things but forget that clothes have the power to speak to people just as loudly as the words you say. The next time you go to an interview, yes, totally be yourself, but be clever about it. Choose something comfortable that sends the vibes that you want your interviewer to feel, but also make sure that you are still recognizable in the end. It would be amusing if you were totally “off of your fashion game” once you accepted the position after the successful interview, but came to work as a seemingly totally different person because your style at the interview was so unlike your typical, everyday wardrobe. It is important to have success at interviews, but it is more important to be accepted for your capabilities and personality.